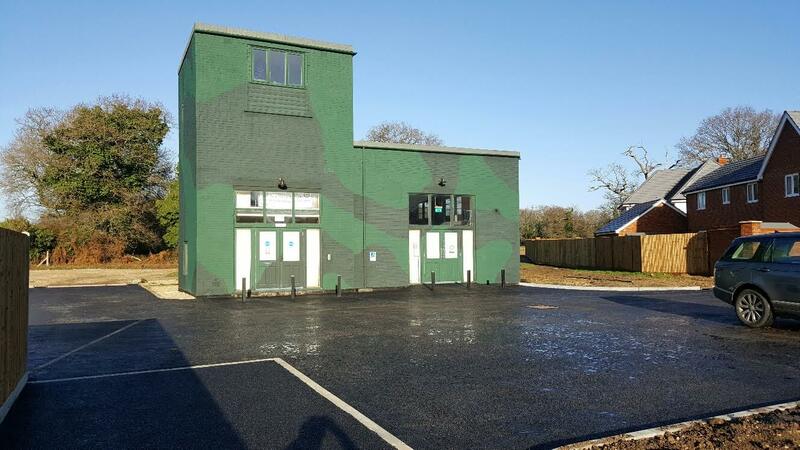 Please note that the New Forest Airfields Memorial at Holmsley South and the FONFA Heritage Centre, between Bransgore and Sopley, are not at the same site and are, in fact, over three and a half miles apart, by the shortest route. For directions from the Memorial to the Heritage Centre, please see this section and map below. The Trustees and Fire Wardens, who are all unpaid volunteers, are happy to consider requests from groups of twelve or more adults, to arrange a bespoke visit to the Heritage Centre (formerly the Museum) at your choice of date and time, by agreement. We will do their best to accommodate such requests, in addition to our normal Outreach Programme for visits by local school parties. The access is off Derritt Lane, which runs between Sopley and Bransgore in Hampshire. 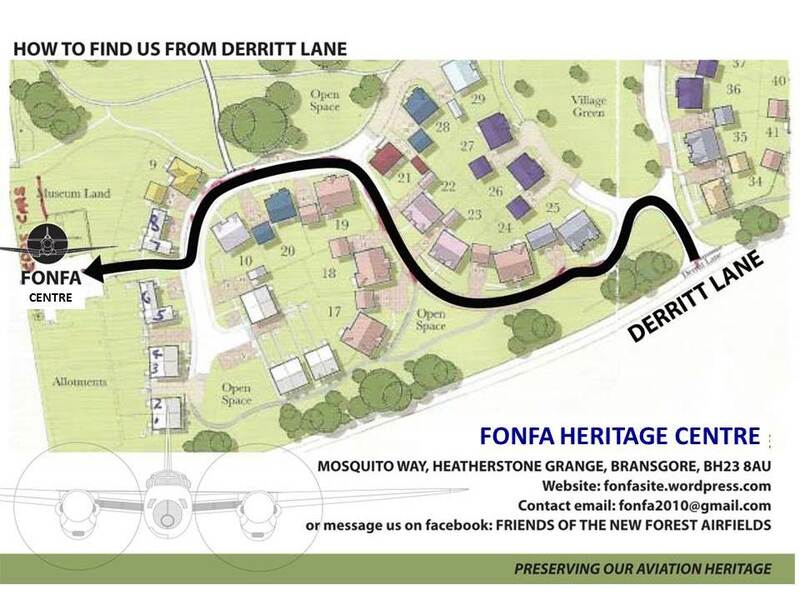 The Heritage Centre is located at the western end of the new Heatherstone Grange Estate. Enter the Estate and immediately turn round to the left, following the arrowed route on the map below, turning right into Mosquito Way just before the Centre. Entry to the Centre is by either free, on production of your FONFA Membership card, or via a donation for non-Members of a Minimum £7.50 for adults, £3 for 10 -16 year olds and free to ‘under 10s’. Pre-1961 Service Veterans are admitted for a concessionary rate of £3, on production of their Service ID. Annual membership (£10 per year) entitles visitors to FONFA Membership for the current calendar year (an unlimited number of visits on Open Days), regular Members’ Newsletters and other events, if visitors wish to become a member. Directions from the Memorial: From the Memorial, drive south along Black Lane, turning right into Forest Road, then pass the Holmsley Caravan Site on your right. After a further 0.25 miles, turn right at the T-junction onto Lyndhurst Road. After 1.5 miles, at the crossroads, turn right towards Bransgore. Continue for 0.9 miles, across the staggered crossroads in Bransgore (left, then right), continuing north on Ringwood Road for 0.4 miles, then turn left into Derritt Lane; the Heatherstone Grange Estate entrance is 0.6 miles along on the right. Enter the Estate and immediately turn round to the left and follow the arrowed route (see map below). The Heritage Centre is situated at the extreme western end of the estate. located on Black Lane, Holmsley South off the A35 between Christchurch and New Milton. Map OS reference SZ 208 987 Post Code BH23 8EB. The post code is for the Caravan Club’s Centenary Site, on Forest Road, nearby. There are brown tourist signs to the Memorial on both the A35 trunk road and on Lyndhurst Road. If you represent a school or are a member of a group or represent a group of people who would like to arrange a visit to the Heritage Centre, during the winter months, please contact us well in advance via the website e-mail address: fonfa2010@gmail.com , with details of your request. School parties are particularly welcome to visit, by arrangement. N.B. Please be aware that we are required by law to have two trained Fire Warden Trustees on site, whenever members of the public are admitted. The Trustees, who are all unpaid volunteers, are willing to consider requests from groups of twelve or more adults, to visit the Centre on mutually agreed days. We will do their best to accommodate such requests, in addition to our normal Outreach Programme for visits by local school parties. I am very pleased to hear the Museum is up and running and I hope to visit this summer. My father was stationed at Sopley from 1960 to 1966 and was based at the old Guardroom as you approached the camp.